A short clip of a vertical roll to a hammerhead, followed by a roll on the vertical down line. It was a lovely day to fly in the Pacific Northwest. For more videos, visit my YouTube channel, BruceAirFlying. It was a lovely day to fly in the Pacific Northwest. 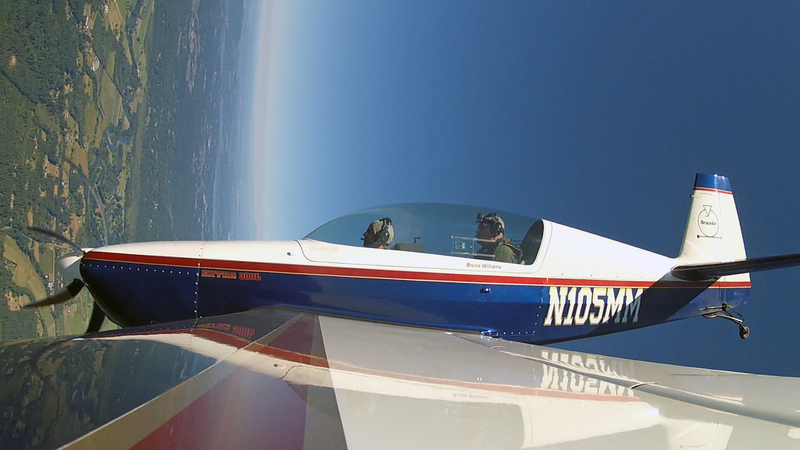 I gave an aerobatic ride in the Extra 300L. Here’s a link to a gallery of images captured from the video. You can find videos of aerobatic flights on my YouTube channel, BruceAirFlying. FAA has published a draft update to AC 90-114A: Automatic Dependent Surveillance-Broadcast Operations. It contains useful definitions and references for pilots who want to learn more about ADS-B. The award-winning creators of the best-selling Train Simulator franchise have today announced a global licensing deal with Microsoft, granting them the rights to develop and publish all-new flight products based on Microsoft’s genre-defining flight technology. The company is currently investigating new concepts in this area and is expecting to bring a release to market in 2015. In addition to this licensing agreement, Dovetail Games is pleased to announce that it has also acquired the rights to distribute the multi-award winning Microsoft Flight Simulator X: Gold Edition via Valve’s popular digital retail channel, Steam, entitled Microsoft Flight Simulator X: Steam Edition. Unfortunately, it doesn’t sound as if the Steam Edition of Flight Simulator X will feature any improvements. Dovetail told GameSpot, "We have the license to re-release FSX on Steam and this does not extend to making product improvements. However, we will include all possible bug fixes we can. One area that will require some work is the use that FSX made use of GameSpy for multiplayer features. As you may know, GameSpy is no longer available and so we are looking for alternate ways of providing this functionality including using features in Steam." Additionally, Dovetail says the new game it’s working on won’t actually be called Microsoft Flight Simulator; it will simply be using Microsoft’s technology. As of yet, there is no title for the new game coming next year. I see many questions about the flight review (formerly called the biennial flight review) that most pilots must complete, per 14 CFR 61.56. Those two items give the instructor who conducts the review a lot of latitude. And they create much confusion among pilots who are looking for an instructor. Often, pilots and instructors have differing expectations about what a flight review should—and shouldn’t—include, how much time it should take, and, of course, what the event will cost. Those documents include references, checklists, and general guidance for the pilot and instructor to ensure that the flight review is more than just a pro-forma exercise. Those tools are also great time-savers for CFIs who want to provide organized, structured, and beneficial flight reviews. Successfully completing a practical test for a new pilot certificate or rating also meets the requirement for a flight review. The FAA recently revised 14 CFR 61.56 to add flight instructor practical tests to those qualifying events. Many CFIs and pilots use resources at FAASafety.gov to meet the ground instruction requirement of a flight review. The FAA site includes a free flight review preparation Course (ALC-25: Flight Review Prep Guide) that essentially meets the requirement for a review of part 91. Printing the completion certificate and keeping it with your logbook helps demonstrate that you’ve met more than the letter of the law. Of course, pilots preparing for a flight review should brush up on the current edition of the Aeronautical Information Manual. It’s available to download as a PDF that you can keep on your tablet or smartphone. FAA handbooks are available for download at Handbooks and Manuals on the FAA website. I also maintain a collection of useful aviation references and handbooks in a public OneDrive folder, Aviation Documents. AOPA Air Safety Institute also offers excellent, free resources for both pilots and instructors, including free online courses, Safety Advisors, and other training aids such as flash cards and webinars. I assign ASI online courses and background reading to all pilots who come to me for a flight review. Start at The Flight Review and the Pilot’s Guide to the Flight Review. If you’ve been away from the cockpit for a while, a typical flight review probably won’t be sufficient to get you back u to speed. AOPA has an excellent program, Rusty Pilots, that helps folks learn about key changes to regulations, airspace, and procedures; and offers advice about finding an instructor. Advanced Avionics Handbook (FAA-H-8083-6), a general introduction to advanced avionics, including PFDs, MFDs, autopilots, and GPS-based navigators. It’s not an operating handbook for specific boxes (you can download free PDF versions of the guides for specific devices from the manufacturers’ websites). But it’s an excellent guide to the core operating principles, standard displays, and other information that applies to all advanced avionics. Instrument Flying Handbook (FAA-H-8083-15B); even if you’re not an IFR pilot, the chapters about flying with electronic flight displays (Chapter 6, Section II and Chapter 7, Section II) are good introductions to the displays and symbols used in typical PFDs and related cockpit displays. Pilots and flight instructors often debate the value of using flight simulation to complement flight training. We casually use the phrase flight simulator when referring to non-flying gizmos that re-create, at varying levels of fidelity, the experience of being in an airplane cockpit. Simulator is a handy shortcut, but can lead to confusion about how such devices can be used during training and to maintain currency. 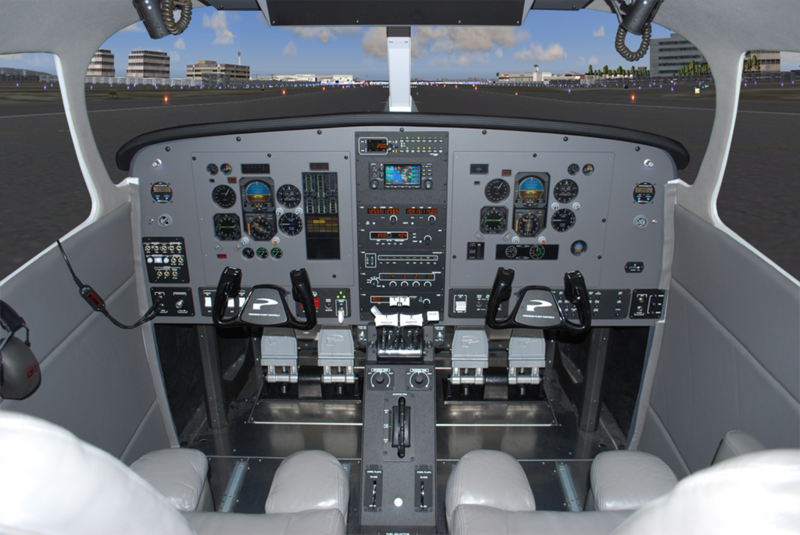 Equally important, misunderstanding the differences among simulations, flight simulators, flight training devices (FTD) and aviation training devices (ATD) often means these tools aren’t used most appropriately or effectively. See also the latest version of AC 61-136B, FAA Approval of Aviation Training Devices and Their Use for Training and Experience. More information here: New AC for ATDs. 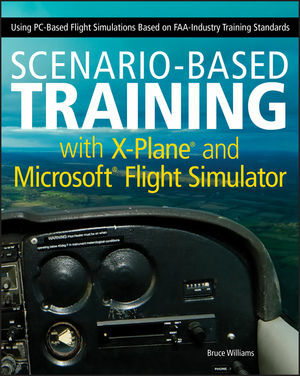 The following discussion is based on Chapter 3, “Using PC-Based Simulations Effectively” in my last book, Scenario-Based Training with X-Plane and Microsoft Flight Simulator: Using PC-Based Flight Simulations based on FAA and Industry Training Standards (ISBN: 978-1-1181-0502-3). For additional information about how the FAA classifies flight simulators and flight training devices, see the November/December 2017 issue of FAA Safety Briefing. That entire edition is devoted to flight simulation. Technological leaps have blurred the lines that just a few years ago distinguished the capabilities of full-motion simulators from the features of the home cockpits that hobbyists set up in their basements and garages. Recent changes to the definitions of and the regulations governing the use of FAA-approved simulators have added to the aviation community’s confusion about these tools. The first two categories are described in 14 CFR 60: Flight Simulation Training Device Initial and Continuing Qualification and Use. ATDs are discussed in AC 61-136. Each category of simulator and training device includes levels that describe the increasing sophistication, capability, and fidelity of the systems. The core of that definition remains “replica of a specific type, make, model, or series aircraft.” In other words, a flight simulator duplicates the performance and flying characteristics of a particular airplane, and it must re-create an airplane’s cockpit with great fidelity, including exact reproductions of the real aircraft’s physical controls, instrumentation, and switches. It must reproduce the aircraft’s flight characteristics with high fidelity. The photo below shows a typical modern full flight simulator made by CAE. That description drops the requirement that an FTD must mimic a specific make or model of an aircraft. The degree to which a particular FTD must emulate an aircraft’s controls, instruments, and switches depends on the device’s certification level, but in general, an FTD doesn’t have to duplicate every switch. The photo below shows an FTD manufactured by Precision Flight Controls. Level 5 and 6 FTDs must replicate the cockpits and flight characteristics of aircraft with increasing precision. In 1997, the FAA published AC 61-126, Qualification and Approval of Personal Computer-Based Aviation Training Devices, which, as the title implies, discussed the use of PC-based simulations. PCATDs, as the devices were known, included software like Microsoft Flight Simulator, hardware (usually one or more consoles that incorporated a flight yoke and other controls and switches), and a display (typically an off-the-shelf computer monitor). Because the technology was new, the FAA restricted the use of PCATDs to a few basic tasks required during primary and instrument flight training. Technological advances and the aviation community’s experience with PCATDs led the FAA to update the definition and expand the use of PC-based simulations. 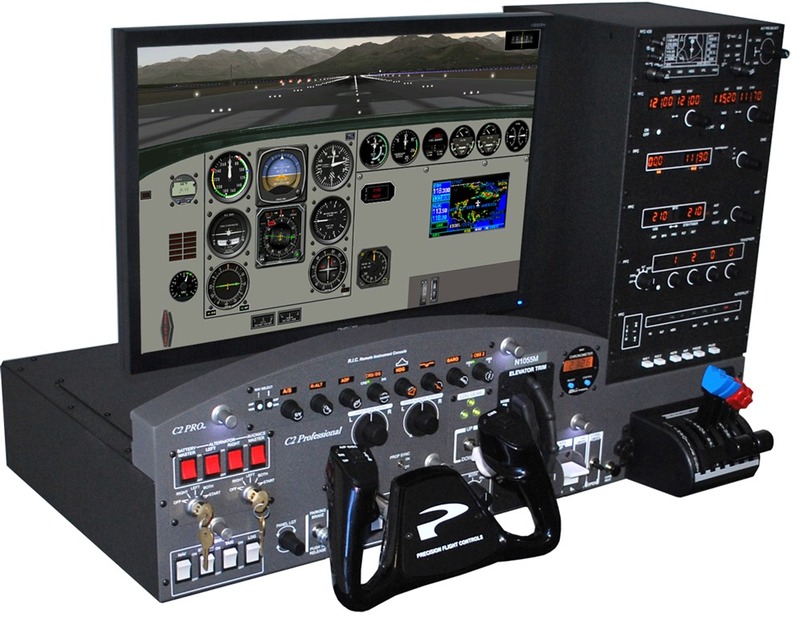 AC 61-136 – FAA Approval of Aviation Training Devices and Their Use for Training and Experience, first issued in 2008, retired the PCATD category and described the PC-based training devices that the FAA now approves for use in aviation training. The photo below shows a typical ATD made by Precision Flight Controls. (1) Physical flight and aircraft system controls should be recognizable as to their function and how they are to be manipulated solely from their appearance. Physical flight and aircraft system controls eliminate the use of interfaces such as a keyboard, mouse, or gaming joystick to control the represented aircraft model in simulated flight. It’s as easy to distinguish superficially between an FFS and a BATD as it is to see the differences between a single-engine trainer and an airliner. But there’s more than technology behind the differences between types of simulation devices. They’re intended for fundamentally different uses. Simply put, an FFS is a substitute for a specific aircraft, and in many circumstances, pilots using an FFS can receive all the training required to operate the simulated airplane and earn a type rating for that aircraft without ever leaving the ground. In fact, airline pilots who have completed training for a new type in an FFS, and who may never have been in the cockpit of the real aircraft that the simulator emulates, often make their first flights in that airplane in regular revenue service with passengers on board. To achieve the level of fidelity necessary to meet that goal, the specifications for an FFS are extensive, detailed, and stringent. As noted earlier, they require that a simulator duplicate a specific cockpit. The FFS must also have a wide-view, high-resolution display; “flying” characteristics that closely mimic those of the real airplane throughout its normal flight envelope; a sophisticated sound system; and motion that accurately re-creates the feel of flying. Level 4, 5, and 6, FTDs are by definition less comprehensive representations of specific aircraft or broad types of airplanes, and as such, the requirements they must meet are less stringent. They also can’t be used to complete all of the training pilots must receive. To earn type ratings or similar approvals to act as the pilot in command of an aircraft simulated by an FTD, pilots eventually must fly the real airplane—or train in an appropriate FFS. A BATD or AATD, however, is not intended to be a replacement for a specific aircraft, or even a series of related aircraft—it’s not a simulator. In fact, as their full names imply, BATDs and AATDs are not even flight training devices. In other words, ATD aren’t intended—primarily at least—to help pilots develop and hone stick-and-rudder skills. They’re essentially procedural and part-task trainers to help pilots understand and apply important concepts and to practice and master general procedures that apply to a variety of aircraft. Finally a simulation, flight or otherwise, is just a representation—these days typically a virtual representation—of something. That something can be a physical object or a process. The key to using PC-based simulations effectively, then, is understanding that like BATDs and AATDs, they are tools to help pilots grasp general principals and practice basic procedures through hands-on experience. You may have noticed the discussion of BATD and AATD hasn’t mentioned X-Plane or FSX. The reason is straightforward—neither product by itself meets the FAA standards for a “training device,” which by definition must include software and hardware, such as flight controls and cockpit switches. The latest flight yokes, throttle quadrants, and other accessories developed for hobbyists, however, meet the FAA requirement that they be “recognizable as to their function and how they are to be manipulated solely from their appearance.” Many BATDs use such off-the-shelf cockpit controls. No issue generates more heated debated among users of PC-based simulations—including pilots and flight instructors—than the perceived realism of the “flight” characteristics (also known as the “flight models,” or, more formally, the “flight dynamics”) of different simulations. (2) Aircraft performance parameters (such as maximum speed, cruise speed, stall speed, maximum climb rate, hovering/sideward/forward/rearward flight) should be comparable to the aircraft or family of aircraft being represented. (3) Aircraft vertical lift component must change as a function of bank, comparable to the way the aircraft or family of aircraft being represented performs and handles. (4) Changes in flap setting, slat setting, gear position, collective control or cyclic control must be accompanied by changes in flight dynamics, comparable to the way the aircraft or family of aircraft represented performs and handles. Put in more familiar terms, the virtual airplane inside an ATD must bank left when you move the yoke to the left. The nose must pitch up when you pull back on the flight controls. Changing power should make the aircraft speed up or slow down (or affect its rate of climb or descent). The rates at which the airplane rolls, pitches, and yaws should be “comparable” to the way a given airplane or family of similar aircraft responds to a pilot’s actions.